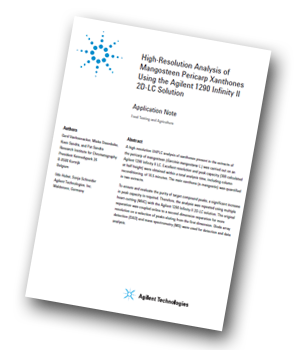 Agilent Technologies has produced an application note demonstrating the high-resolution UHPLC analysis of xanthones present in the extracts of the pericarp of mangosteen (Garcinia mangostana L.) using the Agilent 1290 Infinity II 2D-LC Solution with multiple heart-cutting. Xanthones are a group of naturally occurring compounds that exhibit a variety of biological activities and can be of interest as food supplement. The mangosteen fruit rind (pericarp) has been praised in Southeast Asia for its medicinal qualities. It has been used for treatment of a variety of complaints, and is even proposed as alternative treatment for Parkinson’s disease. The Agilent 1290 Infinity II 2D-LC solution enables comprehensive 2D-LC (LC×LC) and heart-cutting 2D-LC (LC-LC). In LC×LC, the complete separation from the first column is on-line subjected in small fractions to a second separation (dimension), whereas in LC-LC, one or a limited number of fractions is transferred to the second dimension. Using these techniques, the peak capacity generated in the first dimension is significantly increased by the separation carried out in the second dimension. to evaluate the purity of the detected peaks.